Rent Elizabeth F. Gamble Garden | Corporate Events | Wedding Locations, Event Spaces and Party Venues. 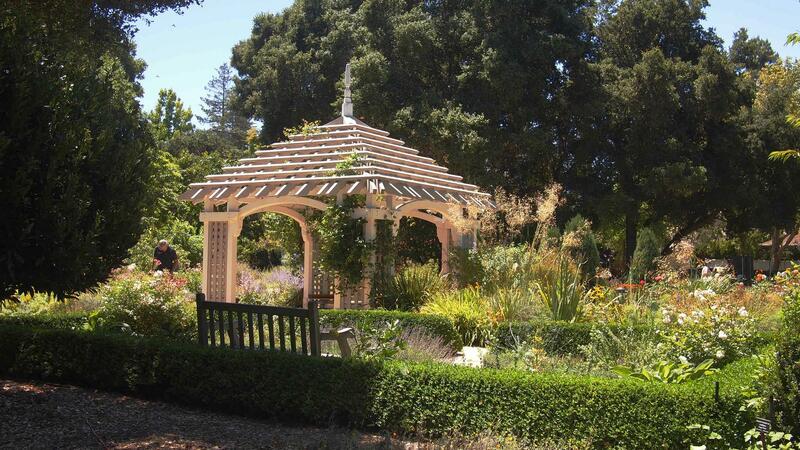 A beautiful garden and historic home make the Elizabeth F. Gamble Garden the perfect setting for an intimate event of 50 guests in the heart of old Palo Alto. Gamble Garden is the ideal location for your wedding ceremony, reception, business retreat, or special event. When you select Gamble Garden for your special event, you and your guests will enjoy the Main House, including the Dining Room, Living Room, and Library with porch; the Carriage House and Carriage House Patio; as well as the Tea House and Tea House Patio. The Rose Garden, the Allée, and Wisteria Garden are within your rental area and are ideal for photos throughout the year. Our wedding/event coordinator, with almost 20 years of experience at Gamble Garden, will advise you with the planning of your special event. Gamble Garden accommodates events with up to 50 guests. Hold your wedding in the Rose Garden, Wisteria Garden, or on the Tea House Patio. Enjoy a reception in the Carriage House or on the Patio. Work with our wedding/event coordinator to plan your perfect event.